I made you some Almond Orange Muffins! The other day, I wanted to make some muffins. I asked everyone in the Facebook group I run. Several people mentioned Almond Orange Muffins. I love that flavor combo, so that is what I made. They came out so good! Kids liked them too. I am a big fan of almond flavored anything. My Flourless Almond Joy Brownies and my Almond Joy Energy Bites are also good examples. 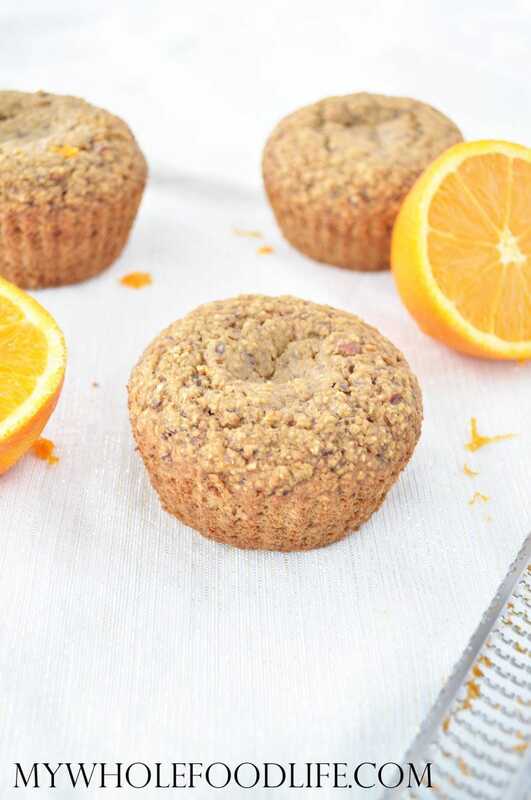 These healthy muffins would be great for on the go. This healthy muffin recipe is vegan, gluten free and oil free. You can make a big batch ahead of time and freeze some for quick breakfasts on the go. I hope you enjoy these muffins as much as we did. Looking for more orange recipes? Make these ahead of time for healthy breakfasts all week! Mix all the wet in another. Spoon batter into muffin cups . Let the muffins cool before removing them from the pans. These should last a couple weeks in the fridge. You can also freeze them for longer storage. Enjoy! Turned out delicious!!! Thanks Melissa! Thanks! I bet you can use applesauce in place of the sugar for a less sweet treat. Could you sub regular all purpose flour for the oat flour? These sound delicious. Just 2 non-related questions, actually: 1. Your book is sold out on Amazon - great for you, sad for us. Any idea on when there will be more available? 2. Do you have any recipes with coconut flour? I bought some the other day for a corn fritter recipe, and thought of making pancakes with it, but so many people had problems with them turning our either really hard or falling apart in the pan. I was wondering if you have made anything with them successfully (and deliciously). Thanks!!! Love your recipes!! These muffins are delectably dense and the flavor is fairly subtle, I really like them. My husband, however, requested something with a stronger flavor, so I stirred some fresh raspberries in to half of the batter: mistake! I could not get the raspberry ones to cook all the way through, I cooked until the outside was burnt and still the middle was batter. Lesson learned. Would these work with almond flour? They may, but I would add an extra egg to be safe.